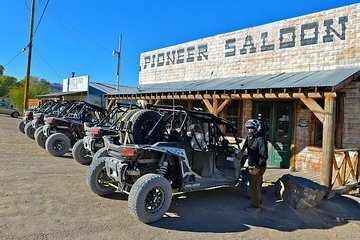 Speed through the Mojave Desert in a powerful Polaris RZR XP1000 UTV on a 4x4 trip from Las Vegas that goes deep into the rugged terrain. You'll be behind the wheel throughout the off-road experience, navigating dry river beds and trails with great views across the scenic landscape. At the end of the trail is the historic and atmospheric Pioneer Saloon, where you'll refuel with an included lunch in the heart of the old west.